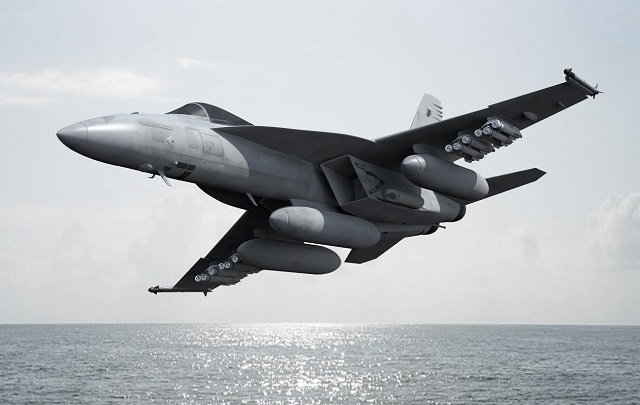 Navy Recognition has learned that the U.S. Navy is beginning environmental and integration analysis of the UK’s combat proven Dual Mode Brimstone missile for F/A-18 Super Hornets. This activity is funded and being managed by the US Navy. Additionally, two recent positive reports from committees of the U.S Congress have expanded the funding in Fiscal Year 2015 by $10M for Dual Mode Brimstone on F/A-18s and asked for the Secretary of Defense’s views on dual mode missile technology. This news is matched by the UK MOD funding BAE Systems 5M British Pounds to begin an integration analysis of Dual Mode Brimstone on the Eurofighter Typhoon. 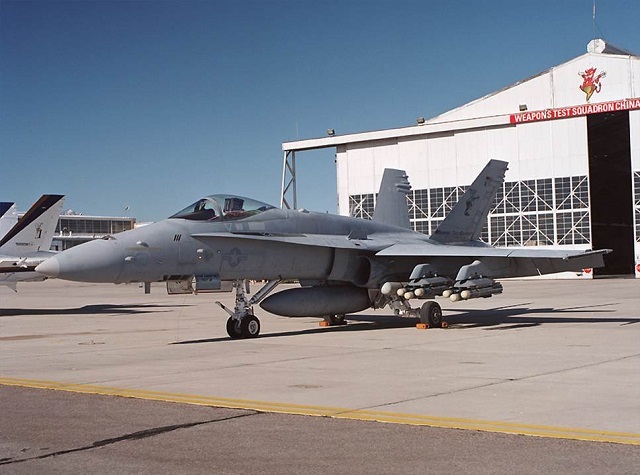 A legacy U.S. Navy F/A-18 Hornet undergoing a fit-check with MMW-seeker Brimstone missiles in 2005 (US Navy Photo). According to a May 2014 report of the Committee on Armed Services House of Representatives: "The committee continues to recommend that the Department of Defense pursue an all-weahter, moving target-capable tactical missile that could be integrated on different military platforms. [...] The Committee is particularly interested in capabilities to counter high-speed, erratically maneuvering targets on land and at sea, as well as understanding how dual mode missiles could be used in counterterrorism (CT) operations. The Subcommittee notes the use of dual mode missiles, to include allied missile programs, could potentially close existing operational gaps, reduce the risk of collateral damage, and may result in cost savings relative to current tactics, techniques, and procedures used as part of current direct action CT operation." "The Subcommittee is aware of the recent integration and successful testing of a fully operational dual mode missile off an MQ-9 “Reaper” unmanned aerial vehicle system for the United Kingdom Ministry of Defense. The Committee notes the Royal Air Force has used this dual mode missile extensively in overseas contingency operations and has reported positive feedback. Further, the Subcommittee is also aware that the Secretary of the Navy is funding an initial analysis of dual mode missile integration on the F/A-18E/F “Super Hornet” aircraft and that initial feedback has been positive." PMA-265 has reviewed the news release and does not have any input at this time. NAVAIR continually works with the fleet and the resource sponsors to prioritize, develop, integrate, test and field improvements for the F/A-18 family of aircraft. The F/A-18 program office will remain flexible based on the priorities set forth by the President’s Budget. In addition, MBDA just announced during Farnbourgh Air Show it has successfully demonstrated its Dual Mode BRIMSTONE missile against fast moving and manoeuvring Fast Inshore Attack Craft even in a cluttered environment with multiple neutral vessels in very close proximity. Conducted in March and April 2014 at the QinetiQ managed Aberporth range in west Wales, UK, an RAF Tornado GR4 aircraft fired two Dual Mode BRIMSTONE missiles (one telemetry and one operational), each fitted with MBDA’s latest Anti-FIAC software upgrades, at remotely controlled, 40ft ASV C13 Fast Inshore Attack Craft targets powered by twin 350hp engines. The telemetry missile achieved a direct hit on the FIAC’s engines with the target operating at its maximum achievable speed in ‘low sea state 4’ conditions. The operational missile achieved a direct hit at the rear of the second FIAC’s cabin, destroying and sinking the target which was operating at maximum achievable speeds in ‘sea state 3’ conditions. Missile impact occurred whilst the target was within very close proximity to three neutral vessels. The target was destroyed and sunk with the single shot and with no collateral damage to the neutral vessels. These tests confirmed Dual Mode BRIMSTONE’s first pass precision and lethality against challenging targets in stressing environments. The dual mode Semi-Active Laser and active MMW (millimetric wave) radar seeker works in tandem to provide a unique ability to selectively engage a specific target irrespective of target speed or manoeuvre even when in cluttered, congested and high collateral risk environments.